Lambeth’s name probably meant that lambs were offloaded at a landing place here, although others suggest that it is a corruption of ‘loamhithe’, and thus refers to the muddy nature of the landing place. This was the spot from which archbishops of Canterbury took the ferry across to Westminster and it therefore made an ideal location for their London pied à terre. The archbishops were lords of the manor of Lambeth from 1197 and soon after­wards built a chapel and a residence on the riverside. The only surviving part is the under­croft of the chapel. 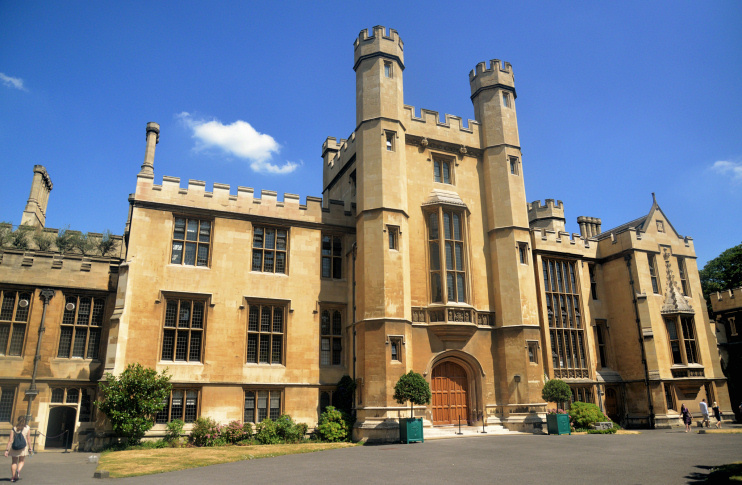 Shown in the photo above, the present Lambeth Palace contains elements from each succeeding century, all harmo­ni­ously integ­rated. The most recent phase of major work was a refur­nishing and enlargement carried out for Archbishop Langton in the early 1830s by Edward Blore. By this time, a warren of streets surrounded the palace and filled the former Lambeth Marsh, to its north. Residents worked at the wharves and boatyards on the water­front, in small factories making whitewash or at Doulton’s pottery. Although other bridges existed nearby, ferries continued to provide the most direct means of crossing the river until 1862, when a suspension bridge connected Lambeth Road with Westminster’s Horseferry Road. Soon after­wards the construction of the Albert Embankment erased many of the riverside yards, while helping to protect the area from flooding. Lambeth Palace now found itself set well back from the river. St Thomas’ Hospital moved from Southwark to a site north of the palace in 1871. Lambeth North station opened in 1906. After a long period during which Lambeth Bridge was restricted to pedes­trian use, it was rebuilt in 1932. Following the deteri­or­ation of the housing stock and severe bomb damage in the Second World War, the Greater London Council redeveloped the area south of Lambeth Road in the 1960s and its former character has been lost. Other streets made way for the expansion of St Thomas’ Hospital. The Florence Nightingale Museum, on Lambeth Palace Road, is dedicated to the life, work and legacy of Britain’s (probably the world’s) most celeb­rated nurse. The medieval parish church of St Mary-at-Lambeth was decon­sec­rated in 1972 and is now the Garden Museum. The artist and poet William Blake lived for ten years in Hercules Road, just east of Lambeth Palace. Captain William Bligh lived round the corner in Lambeth Road and is buried in St Mary’s churchyard. Somerset Maugham’s first novel, published in 1897, was Liza of Lambeth. ‘The Lambeth Walk’ was a song from the musical Me and My Girl and was popularised by Lupino Lane, who first performed it at the Victoria Palace in 1937. The photograph of Lambeth Palace at the top of this page was taken by Barry Marsh, posted at Flickr, and generously released into the public domain.